Maybe it’s okay for a child to face the grave. Last week, Vivienne was paging through In Felicity’s World, a compliment to the American Girl books. She stopped at a photo of a baby-doll that was tucked into a baby-doll-sized coffin. She asked me what it was. The caption explained that, because 50% of children under 6-years of age died during colonial times, this was a common toy to help children face the grave. That took my breath away. Although I don’t plan on adopting such a toy or belaboring a difficult topic for our children, I did wonder if colonial children embraced their faith in Jesus Christ more readily because they saw, quite plainly, why they had to. I wonder if we, with our very low mortality rate, have turned our eyes away from the grave so well that we do not face it until we are 60 years old and our parents pass away from old age. But if we do not face the grave until we are 60, we wait that long to face our arch enemy; to truly understand our great need for Jesus’ triumph. 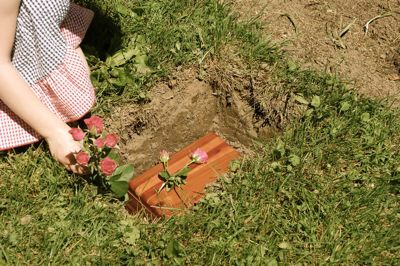 Perhaps, on the rare occasion when death does touch someone we know or love, it’s a good idea to bring our children with us into mourning. Then, we will stand side-by-side anticipating Christ’s promised comfort. Seeing how well both girls have processed Juliette’s death and burial so far, seeing how triumphant their faith has become as they believe more deeply in their Savior and anticipate the day when we will be reunited, and seeing how my own faith has grown and my own eyes have been opened to the gospel with a new desperation, I think that maybe it’s okay for children to face the grave when death occurs. 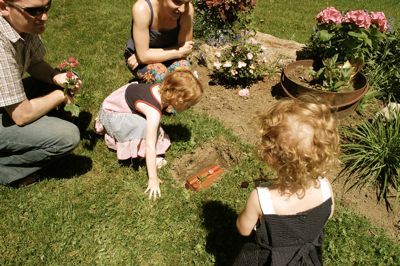 I think it’s okay for children to look upon a loved one’s body that is returning to the earth, and mourn. I think it’s okay for them to cry. Or to stare, wide-eyed. Or, perhaps, to dance by that grave, as sweet Lia did for Juliette. I think it’s okay for children to see for themselves that the grave is desperately wrong; to recognize their own need for a righteous Man to wipe their tears away and make all things new. Perhaps their faith will grow as we hold their hands and explain the gospel to them at that grave site: that Jesus Christ gave his life so that our spirits could rise to greet Him; that He will appear in the sky, will create a new earth, and will restore all things. And if we do that – dealing gently and honestly with them through the mourning – I think that they will not develop an obsession with death; but with life.